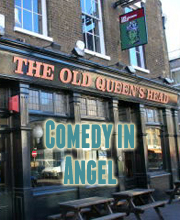 Laugh Out London is excited to launch a brand new night south of the river by teaming up with the lovely folks at The Antelope in Tooting! Joining us for our grand launch are a few of our cast iron favourites including headliner TONY LAW! Buy Your £5 Ticket Here! A Multi-talented high energy act whose Edinburgh show last year earned her an award a best newcomer nomination. Jayde has previously won the Funny Women competition in 2014 as well as starring in her own Sky comedy short for Halloween. One of our favourite acts on the circuit Jordan has risen to prominence following two superbly reviewed Edinburgh shows. Certainly the finest use of physicality you will see in stand up, which is perfectly combined with smart writing.